This art pack includes a robustly animated and armored run n’ gun player character, ready to walk, run, shoot, slide, crouch, flip, and swim his (or her) way through the world you create. Also included are several fully animated basic enemies, a couple of boss-like characters and a few effects you’ll likely find useful for things like impacts, pick-up effects etc. 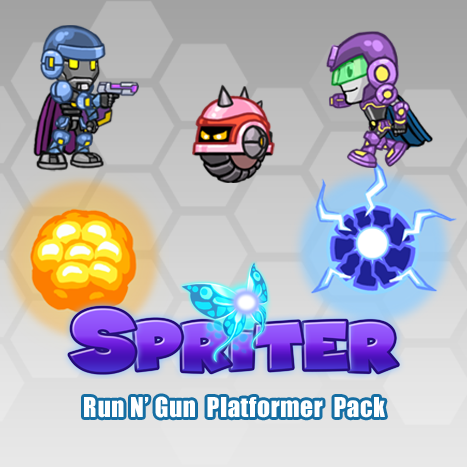 This Art Pack also includes two unique alternate “skins” for the player character..these are unique image sets which turn the player into a female or an enemy robot. In Spriter you can easily customize the animations to suit your needs or use the images or pre-assembled characters in your own unique ways to create completely original animations. Buy this content once and it remains royalty free (non-transferable) for you to use in any of your games, whether they're free, shareware, or commercial. Export your finished animation either as Spriter XML or JSON formats, sequential images, GIF animations, or sprite sheets at any FPS, re-sizing as needed. By legally acquiring an art pack from BrashMonkey LLC, you are granted use of the animations and the art for your own game projects. (whether the games be commercial or free), but purchase of the art pack does NOT grant the right to distribute the animations or art (altered or otherwise) to third parties for free or for profit for use in the creation of their products. Click HERE to read the full Copyright Licensing Agreement.